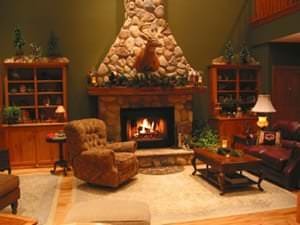 The spacious Great Room, with its wood-burning fireplace, is perfect for conversation or curling up with a good book. The English Pub Billiard Table in the Entertainment Room provides a unique challenge in which women do particularly well. TVs with Direct TV have been added to each room. Feel like a movie? There is a small library of movies in the Entertainment Room. You can watch the movie in your room or on the big screen TV in the Entertainment Room. Add a complimentary bag of popcorn with a glass of wine or soft drink for even more enjoyment. 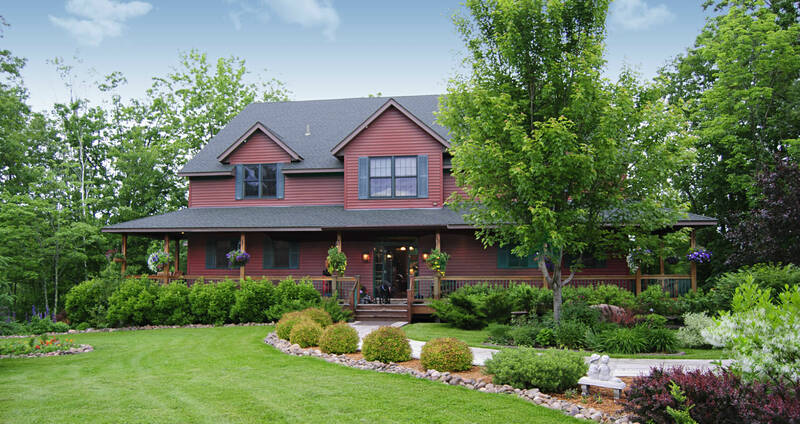 Songbirds, squirrels, deer, and other wildlife offer entertainment daily right outside the windows of this beautiful, Minnesota vacation spot. 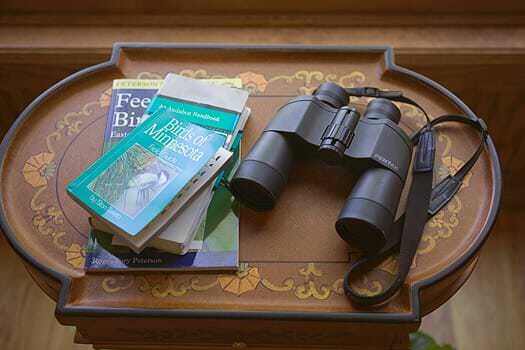 You’ll find a set of binoculars in your room for close up viewing. In addition, there are outstanding opportunities for watching birds and wildlife in the area. With Grace Lake located just down the road, we call our pond “Grace Lake Too”. 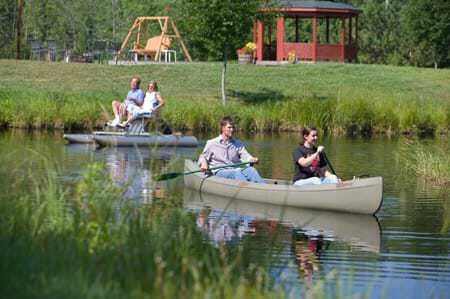 Configured in a figure “8” with an island, the pond is large enough for a nice trip around by paddle boat or canoe. The grass is mowed all around the pond, making for a nice stroll in street shoes. The “trails” of Woodland Trails consists of over 4 miles of private, mowed trails. Enjoy a hike through the woods or snowshoeing in winter. 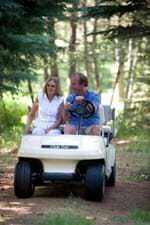 We even have a pair of golf cars for your complimentary use from May through October. Recently we added a pair of fat tire bikes that can be used all summer and, if there isn’t too much snow, in winter as well. A large deck with gazebo overlooks Grace Lake Too. 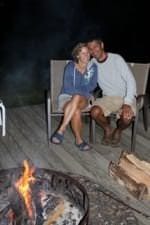 Guests enjoy relaxing on the swing or snuggling next to a campfire blazing in the fire pit.